Nepal's acronym of 'Never Ending Peace And Love' does well to characterise this nation of good-natured and accommodating people; the uppermost place on earth, a land of majestic Himalayan scenery including eight of the world's ten highest mountains, Mt Everest being one of them. Situated between India and Tibet, the Federal Democratic Republic of Nepal is filled with many different ethnic groups, customs and traditions reflected in a wonderfully diverse geography. From the hot Indian plains and steamy southern Tarai lowlands, the terrain crosses the Kathmandu Valley and rises to the frozen heights of the Himalayan peaks towards the Tibetan plateau known as the 'roof of the world'. Spread across these varied altitudes are communities of colourful cultures and people (many untouched by modern development), animated cities and towns, and far-flung mountain villages. Life here revolves around an intricate intermingling of ancient Hindu and Buddhist religious rituals. Numerous festivals are celebrated throughout the year, coloured by a diversity of religious and tribal traditions. 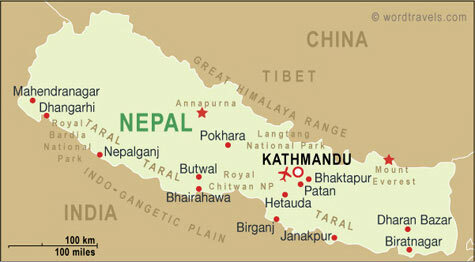 The capital of Kathmandu brings an assortment of these different societies together into a vibrant collection of brilliant sights and exotic smells, with modern shops co-existing with street sellers, while pyramidal Buddhist temples, holy Sadhus of the Hindu faith and medieval palace squares fill the urban landscape. Nepal boasts many attractions, but the essence of the country is its smiling, friendly people with their heartfelt palm-pressed greetings, and with its inspiring scenery, this beguiling kingdom is a place where one visit is usually not enough to satisfy the captivated traveller. Nepali is the official language. English is spoken in all major tourist areas. Travellers to Nepal do not have to pay duty on 200 cigarettes, 50 cigars or the equivalent in other tobacco products; 1 litre of alcohol, and perfume for personal use. It is illegal to export goods that are over 100 years old. Electrical current is 220 volts, 50Hz. Round two and three-pin plugs are used. Nepal has two seasons: the dry season from October to May, and the rainy monsoon season from June to September. Climatic conditions vary according to altitude in Nepal, with temperatures becoming steadily lower as altitude increases: in the north it is seldom hot, with cool summers and freezing winters; whereas the south is almost tropical, with mild winters and hot summers. In the Terai summer temperatures can exceed 98°F (37°C) and winter temperatures range from 44°F to 73°F (7°C to 23°C). Kathmandu has a pleasant climate, with temperatures averaging 66°F to 95°F (19°C to 35°C) in summer, and 35°F to 53°F (2°C to 12°C) in winter. Nepal is actually a year-round destination, especially the more tropical south. However, early spring (March to April) and late autumn (October and November) are the best times to visit Nepal, and also offer the clearest mountain views and good weather for trekking. In the winter, from December to February, there is snow on the mountains with freezing temperatures at high altitudes, while the summer months of June to August can be very hot for travel to the south. All foreign passengers to Nepal can obtain a tourist visa on arrival in the country. These visas are valid for a maximum of 90 days, and cost between USD 25 and USD 100 (depending on the length of intended stay). Note that extensions of touristic stays (up to 150 days) can be arranged after arrival, by applying at the Department of Immigration in Kathmandu or Pokhara (fee: USD 20, plus an additional charge of USD 2 per day extended). All tourist visas are valid for Kathmandu Valley, Pokhara Valley and Tiger Tops (Meghauli airport) in Chitwan. However, if travellers wish to visit other places, or trek in Nepal, permits can be obtained from the Central Immigration Office. Note also that passengers who need a visa for India, and who also want to visit Nepal, should hold a visa valid for two entries into India; and that persons wishing to re-enter into Nepal, and having in their passports any previous Nepalese visas cancelled (invalidated) by the Central Immigration Office, will be refused entry and deported. A yellow fever vaccination certificate is required, if arriving in Nepal within six days of leaving or transiting through an infected area. NOTE: It is highly recommended that your passport has at least six months validity remaining after your intended date of departure from your travel destination. Immigration officials often apply different rules to those stated by travel agents and official sources. US citizens must have a passport that is valid for six months beyond their date of arrival in Nepal. A visa is required, and can be obtained on arrival. British citizens must have a passport that is valid six months beyond their date of arrival in Nepal. A visa is required, and can be obtained on arrival. Canadian citizens must have a passport that is valid six months beyond their date of arrival in Nepal. A visa is required, and can be obtained on arrival. Australian citizens must have a passport valid for six months beyond their date of arrival in Nepal. A visa is required, and can be obtained on arrival. South African citizens must have a passport that is valid for six months beyond their arrival in Nepal. A visa is required, and can be obtained on arrival. Irish citizens must have a passport valid for six months beyond their date of arrival in Nepal. A visa is required, and can be obtained on arrival. New Zealand citizens must have a passport valid for six months beyond their date of arrival in Nepal. A visa is required, and can be obtained on arrival. Travellers arriving from infected areas require a yellow fever vaccination certificate. Malaria is a health risk between June and September in the low-lying areas of Nepal, including Chitwan National Park, but not in the common trekking areas. Travellers should consult their doctor about whether malaria prophylaxis is necessary. Outbreaks of Japanese encephalitis occur annually, particularly between July and December, and vaccination is advised. Vaccinations are also recommended for hepatitis A, hepatitis B and typhoid. Those who will be in contact with animals, especially bats, may want to consider a rabies vaccination as well. Cholera outbreaks occur and food and water precautions should be followed. Untreated water must be avoided; visitors should buy bottled water or purify their own. When trekking it is preferable to treat river water rather than leaving a trail of plastic bottles behind. Purifying water with iodine is the cheapest and easiest way to treat water. Altitude sickness is a real risk for trekkers: many people suffer from altitude sickness above 8,202ft (2,500m); if symptoms persist it is wise to descend as quickly as possible. The standard of care in hospitals varies, but there are traveller's clinics in Kathmandu and numerous pharmacies in the major towns. Medical insurance is essential, and should include air evacuation. All required medications should be taken into the country in their original packaging and accompanied by a signed and dated letter from a doctor detailing what they are and why they are needed. There are safety concerns in Nepal. Demonstrations and public gatherings should be avoided, as there is a risk of violence. Due to previous bomb attacks and shootings in public places, including the main tourist areas of Kathmandu, Pokhara and Lukla, as well as on popular trekking routes, visitors are warned to be particularly vigilant. Tourists have been involved in several violent incidents, with foreigners targeted in recent attacks in the Thamel district of Kathmandu. All are advised to be cautious after dark and to stay in a group at night. There have been incidences of violent robbery against trekkers and there is an armed Maoist presence on many of the major trekking routes who demand a 'tax' before allowing trekkers to pass. Trekkers are advised to stay on established routes and walk in a group or with professional guides. Foreigners have been attacked in the Nagarjun Forest Reserve just outside Kathmandu and visitors are advised to be cautious in the area and to travel in a group. The official currency is the Nepali Rupee (NPR), which is divided into 100 paisa. As getting change can be a problem it is recommended that visitors have a supply of small notes handy. Tourist activities are often quoted in US Dollars and it is advisable to carry new dollar bills in varied denominations. There are ATMs in Kathmandu and Pokhara. Visa, MasterCard and American Express credit cards are accepted in many tourist hotels, shops, restaurants and travel agencies. Banks and moneychangers are present in all tourist centres and in the major cities. All receipts from foreign exchange transactions should be kept so rupees can be exchanged back into foreign currencies on departure. Cash is needed when trekking. Nepal has numerous cultural practices that may be unusual for foreigners. In the tourist areas, there is a high degree of tolerance towards visitors, but away from these places foreigners should be sensitive to local customs. Never accept, offer, or eat anything with the left hand. Do not eat from someone else's plate or offer food from one's own. Women should dress conservatively and cover up as much as possible. Permission should be sought before taking photographs, particularly at religious sites. Public displays of affection between men and women are frowned upon. The Nepalese are warm and friendly, and business tends to be conducted with a combination of formality and sincerity. Much time is given to small talk and socialising. Handshakes are fairly common, though one should wait to see if greeted with a hand, or a a traditional greeting of a small bow accompanied by hands clasped as if in prayer. Visitors should return the greeting as it is given. Dress tends to be formal and conservative, with suits and ties the norm. Titles and surnames are usually used; the elderly in particular are treated with great respect and the word 'gi' is added after the name as a polite form. Punctuality is important, although it may take some time to get down to business, and negotiation can be a long process. English is widely spoken and understood, though discussions in Nepali may occur between locals within a meeting. Business hours are usually 9.30am or 10am to 5pm Sunday to Thursday (closing at 4pm in winter). Saturday is a holiday. Restaurants and hotels may add 10 percent to bills, in which case no further tip is required; otherwise a 10 percent tip is customary in places that cater to tourists. It is customary to tip guides and porters on treks. Elsewhere, gratuities are not expected, but are always appreciated. Home to eight of the world's highest peaks, Nepal is a mountaineer's dream. Most tourists begin their journey in the bustling capital of Kathmandu, but soon make their way to the Himalayas. Whether exploring the Annapurna, Langtang, or Everest regions, trekkers will encounter turquoise lakes, mountain villages and lush valleys with snow-capped titans towering above. Visitors will have no problem finding a trek that suits both their level of experience and budget. From gruelling Everest expeditions to 'teahouse treks', where hikers lighten their loads by relying on 'teahouses' for food and accommodation, veteran mountaineers and casual wanderers will be equally captivated by the majesty of Nepal. Travellers can further take advantage of the country's diverse natural beauty by embarking on white water rafting trips, or exploring the jungles of the southern Tarai belt, seeking Bengal tigers from the back of an elephant. With countless shrines and temples scattered across the country, Nepal's spiritual and religious heritage also attracts numerous tourists and pilgrims. The UNESCO World Heritage site at Lumbini is considered the birthplace of Gautama Buddha, and the 5th-century Swayambhu Stupa, with prayer flags fluttering from its golden spire, is one of the most sacred Buddhist sites in the country. Travellers can also visit Pashupatinath, one of the world's largest Hindu temples dedicated to Shiva, and can step back in time upon visiting the ancient royal cities of Patan and Bhaktapur.